Written as part of an independent study project executed during the Georgia Tech "Modern Cities; Modern Architecture" program in 2008. A PDF version is available here. The complex relationship between space, time, speed, and perception is something that physicists and philosophers have been struggling with for years. In physics we have the general theory of relativity which deals with physical manifestations of relative measurement—for example the properties of time may change depending on the frame of reference in which it is being measured. In philosophy we have relativism, dealing with the perception and definition of truth—where our morals, our sense of place, and our definition of reality are all dependent on our individual situations. Beyond physics and philosophy, this approach to reasoning and discourse is crucial to architecture—a field where we continuously grapple with the perception of hypothetical inhabitants as we design spaces. The spaces we design on paper may seem static, with absolute size and specific use—but as soon as a thinking being sets foot in that space, a new truth is created by their perception. Naturally, this is applicable to urban designers and planners as well, on a larger scale. This essay will argue that the space planning professions have, regardless of intention, submitted to a relativist philosophical framework—necessarily reserving judgment on the desirability of this submission. Across history, the increasing average speed of travel in our cities has brought about the existence of several drastically different urban typologies—but the perception of a traveler within this urban space has remained constant in its key aspects. By allowing larger lots, wider roads, and larger building with larger rooms, the space planning professions have capitulated to relativism by accepting that density is not an immutable truth defined by space, but rather a subjective reading affected by the passage of time. That is to say, the frequency of features has become as important as their physical density in contemporary space planning. By simply looking at several cities with different histories, we can clearly see how the physical velocity of inhabitants has drastically changed their definition of space and their perception of time. This essay will examine three examples. The first two are European cities recently visited by the author: Paris and Rotterdam. Paris is notable for its density and the propensity of its residents for walking—these constitute the characteristic speed and space for the city. Rotterdam is notable because of the fact that it has been almost completely rebuilt in the past half-century, in the process losing much of its pedestrian past, replacing it with a bicycle-dominated transportation structure. Rotterdam has lost much of its density, and the average speed of its inhabitants has increased with the ubiquity of the bicycle. The third city to consider is an American city that the author is familiar with: Atlanta. What was said about Rotterdam also applies to Atlanta, but to a greater degree. The vast majority of the city has been built within the last 40 years. The city is the poster child of the automobile age. Cars are ubiquitous, and the average speed of travel in Atlanta is thus yet quicker than Rotterdam. Likewise, the urban form is another step less dense. Thus are the author’s basic perceptions of the three case cities; but how can these changes in travel speed and urban density be specifically pegged as the expression of relativism? In order to justify this, each city must be described from the point of view of a traveler using the city’s primary mode of transport. An appropriate example here would be the stroll from home to the metro, in which thousands of Parisians partake each weekday morning. Even if we consider the metro stop as a transfer node, and discount what one may encounter in the station or during a ride, the array of goods and services that a typical Parisian will encounter is substantial. Likewise, the population of the built environment adjacent to their path of travel will also be substantial. The distance traveled, however, will be quite small. Most people walk at about two miles per hour. With this assumption, we find that a ten-minute walk traverses about one third of a mile. Thanks to Google, we can easily select a one-third mile stretch of Paris and list and categorize the available goods and services. In order to estimate the population of the area around our hypothetical traveler’s path, we should formulate an appropriate buffer for the path. 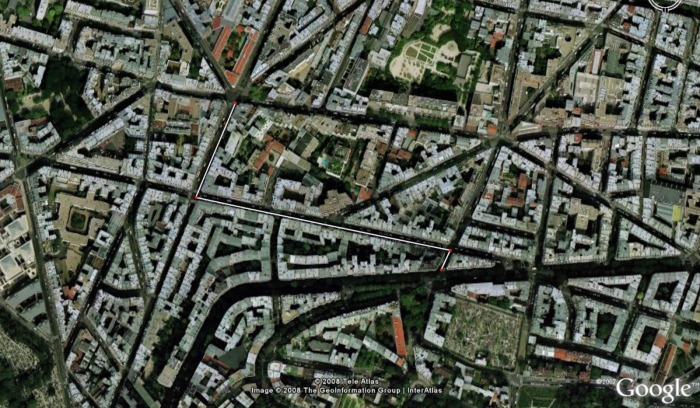 Based on a visual examination of building footprints, most housing in this Paris neighborhood lies within 35 meters of the center of the street, and thus the buffer will be set at 70 meters. Given that 0.32 miles is 0.51 kilometers, we multiply this by the buffer width and we have a calculation area of 0.0357 square kilometers. The population density of Paris is 20,569 persons per square kilometer, according to the 1999 census as reported by INSEE. Carrying this forward, the calculation area has a population of 734 Parisians. Rotterdam does not lack a public transit system. Trams are fairly abundant, and there exists a limited subway system. However, in Rotterdam the tram stops and subway stations are less nodal. For Rotterdam it would not be as appropriate to examine a ten-minute bike ride to a subway stop. More likely, a Rotterdammer would simply ride the bike all the way to work. Thus we will select a ten-minute route that extends from one of the cities large office buildings outward toward a more residential section of the city. An experienced cyclist should be able to maintain speeds of 8 to 12 miles per hour, so a ten-minute trip would be about 1.5 miles. 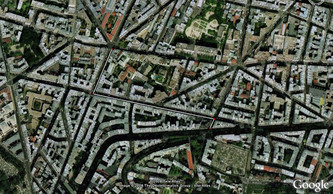 Using the same method a Paris, the buffer width for Rotterdam will be 100 meters. The basic morphology of Rotterdam housing is very similar to that of Paris, but extra distance must be added to account for wider streets and larger courtyards. The calculation area is 0.249 square kilometers. Rotterdam’s average population density is listed as only 2,889 people per square kilometer by the Rotterdam Center for Research in Statistics. 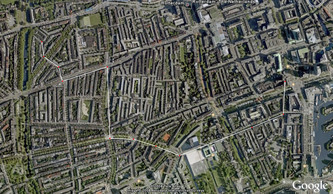 Taking the data as-is, we have a population of 719, however the true population is probably greater, as the density calculations take into account the relatively uninhabited port areas—the true density of this part of Rotterdam is probably significantly higher than the quoted statistic. Atlanta presents a similar case. The most useful node to study will be the workplace. Since the majority of the MSA’s population lives outside the city proper, the trip to study in Atlanta is from an exurban housing development to an exurban office park. 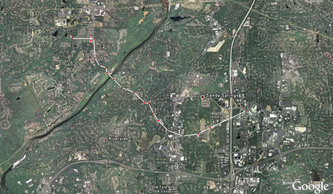 Where Rotterdam and Paris have rapid public transportation, Atlanta has highways. To make the comparison more fair, highway on-ramps will be considered transfer nodes, and thus the route to be examined in Atlanta will be confined to surface streets. Average rate of travel for this type of street should be about thirty-five miles per hour, taking into account stoppage. The route will be about 5.5 miles. The buffer width for this part of Atlanta will be 250 meters to each side of the road, due the free-standing, single-family structures that dominate the landscape. 500 meters is 0.3106 miles (the same as the entire trip in Paris! ), then giving us a calculation area of 1.655 square miles, or 4.286 square kilometers for purposes of comparison. 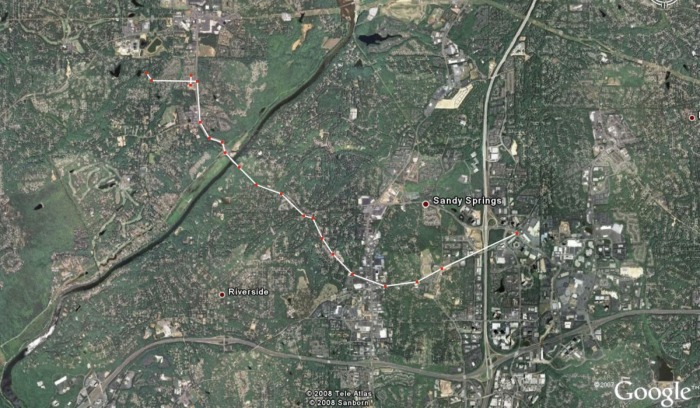 According the US Census, the census tract by which this path is predominately contained has a population density of 1,531 people per square mile (591 per square kilometer). Calculation area population is 2,533. The results of this rudimentary study are somewhat surprising. Firstly because of the unexpectedly low business count on the Paris route. There are two possible explanations for this anomaly. One is that there is some absolute lower limit for the amount of space a business needs to operate, and this threshold is limiting the density of businesses in Paris. The second explanation could be that the data set for Paris is less complete than for the other two cities. Another surprise was the huge calculation area population for Atlanta. It seems the sheer size of the area was able to overcome the low population density figure. Upon further consideration, this fact seems suitable because it gives Atlanta the highest population load per business. Hence the crowds and traffic that exurban development is known for. Rotterdam seems to have the best of both worlds. The bicycle-oriented morphology has given the city a significant edge on the businesses per capita figure, even taking into account the suspect density data. 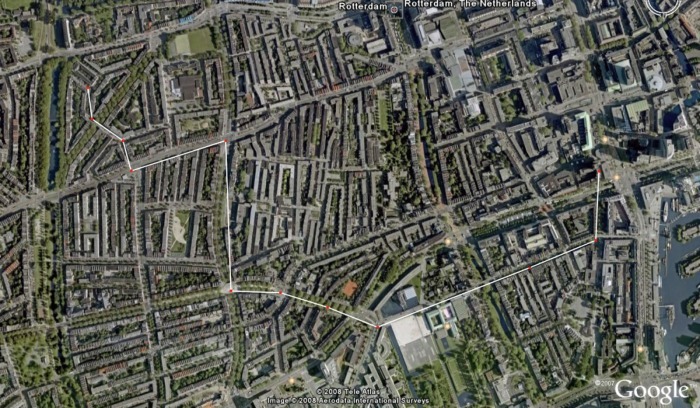 Even if density were calculated with a correction factor of 200 per cent, Rotterdam would still be on par with Paris. Furthermore, Rotterdam’s pedestrian comfort has not suffered significantly as a result of bicycle oriented infrastructure design—nor is the traffic particularly daunting to motorists. Meanwhile Paris’ density makes driving and cycling nerve-wracking, and Atlanta’s lack of density makes walking and cycling rather unpleasant. Essentially, Rotterdam has taken a moderate, egalitarian approach to transportation planning, whereas Paris and Atlanta radically favor a particular mode of transport. This study set out to debunk some of the common critiques of sprawl by examining it from relativist philosophical viewpoint. Could it be considered hubris to deny our clients the option of sprawling development when, in fact, their individual perception of urban density will not be affected as they whiz by in their cars? Can there be factual evidence to convince skeptics that sprawl is wrong, not ethically, but factually? The findings of this brief study indicate that the answers to these questions are no and yes, respectively. We are absolved of hubris if we can point to hard facts that show sprawl reducing access to goods and services, and increasing energy use. This focus on efficiency removes morality from the issue, making it possible to have objective insight on our lives. Simple economics can tell us that density is, in fact, objectively good (or correct, rather) by virtue of being more efficient. This consideration of objectivity and subjectivity is important in trying to understand the effects of relativism in our field. We must note the hypocrisy of trying to use objective means to prove anything about relativism. Relativism itself argues that there are no objective means. One man’s efficiency is another man’s loss of character. The objective study ignores non-quantifiable things like the beauty of open space. The relationship between relativism and relativity also suffers from this affliction. Is a provable scientific theory like relativity really uncolored by the scientists’ milieu? The truth of the matter (or at least the author’s perception of the truth) is that no matter how convinced we are that sprawl is wrong, as a society we are relativist and thus this assessment is useless. For every architect or planner that responsibly refuses to build a sparse subdivision, there will be another to step up and build with no qualms—one whose perception of truth better matches the client’s. The idea being that when a pedestrian enters the metro system, they have transferred to another mode of travel. Since this comparison attempts to focus only on one primary mode of transport, the time spent by this hypothetical Parisian on the metro will be discounted as a secondary mode of transport. It is important to note that this database is in no way authoritative. Personal experience in the area reveals that many businesses are not listed in this database. It is used only because it is a widely available (international) basis for comparison. An interesting side note is that this path passes no less than six places of worship—a category that did not even appear in the other two cities. Tract 303.19 data is available in Summary File 1, Table GCT-PH1 at http://factfinder.census.gov.